You are now registered with CarpCup. Now we are going to take the standard tour and access the on-line enduros for the first time. You are going to log on, therefore, from the home page: enter your nickname and password in the fields in the "Access to the enduros" box and then press the Ok button. 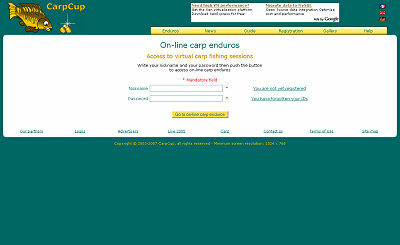 CarpCup then processes your request to access the on-line carp enduros. CarpCup has identified you and returns a page that, on the left, gives you the ranking associated with the current on-line carp enduros and, on the right your own personal information. Taking part in an on-line carp enduro means carrying out one or more fishing sessions. To start with, we advise you to take part in practise fishing sessions and familiarize yourself with the game environment. To do this, click on the button "Practice". CarpCup then downloads the various elements of the practice peg. You can follow progress on the downloading screen. You will return to this screen every time you go to a peg. A practice fishing session enables you to familiarize yourself with the fishing environment and to master the various methods of control that occur as the session progresses. A practice fishing session is free. 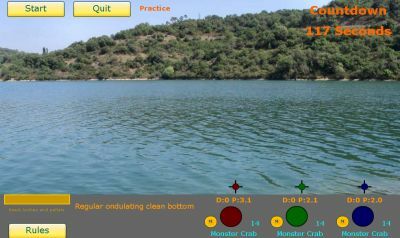 It has the same concepts as the enduros fishing sessions but some attributes are not included. And it always takes place at the same peg and does not lead to ranking.